HAARLEM (Neth.) - Konica Minolta Pioniers re-took the lead in the best-of-five Holland Series by winning 7-4 on Sunday in Game Three vs. Corendon Kinheim. For the third time, the visiting team ended up as the winner. The Series resumes next Saturday in Hoofddorp with Game Four. If needed, Game Five will be played on Sunday in Haarlem. The game started an hour earlier than normal, because of television coverage, but also lasted an hour longer than average. After three hours and 24 minutes, the game ended, but it was worth it. Despite a slow start, the game got everything. From a lot of walks, nice basehits and great defensive plays. It already is one of the most spectacular Series ever, because of the high level defense. In this game, Pioniers turned four more double plays, to bring their Series-total to eleven to set a new Series-record. But Kinheim also turned three double plays today. Rookie Jean-Paul Gulinck started for Kinheim, but had a nervous start, as he walked the first two batters he faced. However, the lefthander ended the at bat unharmed, as the next three batters all flied out without moving the two runners. But in the second inning, Pioniers opened the score. 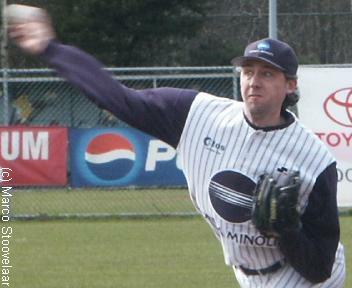 Edwin de Graaf led off with an infield-hit, then moved on a sac-bunt by Norbert Lokhorst. After Lars Koehorst walked, De Graaf scored on a single by Marcel Venema. Gulinck then also walked next batters Michael Duursma and Mark Duursma (who both also walked in the first inning) to bring in another run. The young lefthander was relieved by Duko Jansen, but this more experienced pitcher also couldn't stop Pioniers. He started with a wild pitch, which enabled Venema to score, then saw Glenn Romney ground out, but then gave up a 2-run single to Dè Flanegin, which made it 5-0. A single by Glennsig Polonius and a walk for Edwin de Graaf loaded the bases again, but the inning ended when Norbert Lokhorst, the eleventh batter in this inning, popped out. In the next three innings, Jansen allowed only two batters to reach base and was assisted by a double play. Pioniers turned its first double play, and eighth in the Series, in the first inning to set the tone again for this game, as the team again played very solid defensively. In the second inning, Kinheim got one run back. Tjerk Smeets led off with a single, then Edward Illidge walked. With one out, the bases were loaded when Vince Rooi singled. Smeets then scored the first Kinheim-run when Wouter Heemskerk grounded out, but a pop-fly followed, leaving two runners in scoring position. In the fourth inning, Kinheim narrowed the deficit to 5-4 by scoring three runs. Tjerk Smeets led off with a double to deep leftfield. After Edward Illidge grounded out, Roel Koolen walked, as did Wouter Heemskerk after Vince Rooi struckout. With the bases loaded, Pionier-starter Roger Kops also walked next batter Denny Beljaards to bring in a run, then gave up a 2-run single to Danny Rombley, which made it 5-4. Kops was relieved by Erik Jan Lind, who re-loaded the bases by walking René Cremer, but then the inning ended when Dirk van 't Klooster flied out. Erik Jan Lind, who also made his debut in the Dutch big league this season, did a great job hereafter. The righthander, who pitched for First Divisionist Alcmaria Victrix the last seasons, threw five innings in which he gave up only four basehits to the hardhitting line-up of Kinheim. Only one runner reached third base off Lind, who was supported with three double plays. In the sixth, he gave up a lead-off single to Vince Rooi, who moved on a sac-bunt, then advanced to third on a single by Denny Beljaards. But then, Danny Rombley grounded into a double play, which tied the Series-record. After a scoreless seventh inning, Lind gave up a lead-off single to Edward Illidge, but then another double play followed on a grounder by Roel Koolen, which was the record-setting eleventh for Pioniers in only three games. Pioniers added a run in the sixth inning. With one out, Marcel Venema and Michael Duursma singled. Next, Mark Duursma grounded through the middle where short stop René Cremer had to chance to turn a double play, but committed an error instead. This enabled Venema to score a run. In the eighth inning, Pioniers increased its lead to 7-4 off Michiel van Kampen, Kinheim's closer who was brought in in the seventh to relief Duko Jansen. Marcel Venema (who was 3-for-4) led off with a single and reached second base on a sac-bunt by Michael Duursma. Venema moved to third on a single by Mark Duursma, then was lucky on the next play. He was halfway between third and home when Glenn Romney hit the ball to short rightfield where it dropped for a basehit, just out of reach for rightfielder Dirk van 't Klooster, so Venema scored. When Van 't Klooster would have caught the ball, Venema would have to return to third base and would have no chance anymore of scoring a run. In the ninth inning, Pioniers got another runner on base when Glennsig Polonius led off with a walk. He was replaced by speedy Jefferson Muzo and a bunt was expected. That didn't happen and next batter Edwin de Graaf flied out. Muzo then stole on the next pitch, then also tried to steal third base while Norbert Lokhorst struckout. Muzo appeared to slid in time into third base, but was called out by 3B Umpire Winfried Berkvens to complete a double play and end the inning. In the home ninth, Danny Rombley singled with two outs. Erik Jan Lind was then replaced by closer Dave Draijer, who got René Cremer to ground out and end the game. Pioniers had taken a 2-1 Series-lead. Thank you for visiting this site. See you soon!